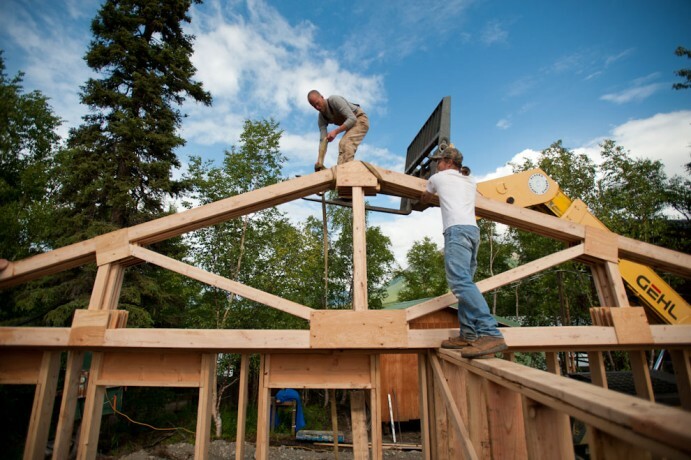 Samaritan’s Purse recently completed its 29th building project in Alaska with a new church facility for Mountain Village Covenant Church. A vessel crossed the Bering Sea in 1919 and traveled inland along the Yukon River to help start the first native-led church in the newly-established settlement of Mountain Village—a small community in southwestern Alaska. Mountain Village is an isolated community on the Alaska Tundra along the Yukon River. The ship’s name was Hope and it was carrying its namesake—the hope found only in the Gospel of Jesus Christ. Over the decades, Mountain Village Covenant Church has been a spiritual refuge from the sometimes harsh realities of tundra life. Like many parts of Alaska, Mountain Village has suffered under drug and alcohol abuse, domestic violence, and despair. More than 50 people in this village of less than 1,000 people attempted to take their own lives this year. So Mountain Village needs the church, but the church was in desperate need of assistance as well. They were meeting in a “new” building constructed back in 1995. Worn down and weathered by the brutal Alaska winters, the two-decades-old structure had fallen into disrepair. Children play outside the new church building, and church leaders hope the new building will draw the attention of children and their parents. Corey Lynch, left, is director of Alaska projects for Samaritan's Purse. Corey hands over the church's keys to Pastor Marc Murchison. Children are excited about the new church building that Mountain Village Covenant Church received. We pray that younger generations in Mountain Village will experience the life-transforming power of the Gospel. Members of the church enjoy a time of sharing as well from the pulpit. Corey Lynch, director of Alaska Projects for Samaritan’s Purse, encourages church members to enjoy and to use the new building for God’s glory. Instead of fixing up the existing building we were able to begin work on an entirely new one, right next to the old. It would provide more efficient heating, more space, more storage, and serve as a well-built place for people to gather in worship. Over the course of this past summer, 84 Samaritan’s Purse volunteers arrived in Mountain Village to help construct the building. And after months of work, our teams put the finishing touches on the new meeting space. On Sept. 9 the church, community, regional church leaders, and Samaritan’s Purse leadership arrived to celebrate God’s work through His church in the community. We dedicated the new building and handed off the keys to the church leadership. “We believe that this is going to be a tool that God will use for the next 100 years to bless the village, to bless the people of the village, to honor God, and hopefully to use as an outpost to reach out to other villages that are close by,” said Pastor Marc Murchison. Dennis Agajanian and his brother Danny perform some tunes at the church dedication. Luther Harrison, Samaritan’s Purse vice president of North American Ministries, reminded the church about the profound power and purpose of such a building in this remote corner of Alaska. Pastor Marc encouraged his congregation to use the new building as an opportunity to point others in the community to the hope found only in Jesus Christ. Lloyd Alexie, a long-time member of the church, said he is praying that the new building encourages many more children and families to come to church and learn about Jesus.